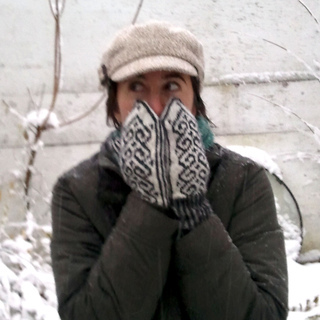 Celebrate winter and all it offers knitters in the North! Prepare for the next big storm or meditate on winter landscapes while following this pattern’s vertical direction: due north. Due North requires stranded knitting techniques and knits up tightly with natural colored yarns at 6 sts to an inch on #3 (3.25mm) double pointed needles. 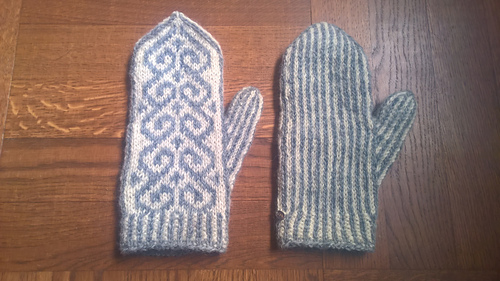 Requiring only 200-300 yards of yarn in 3 colors for women’s mitten, this small project offers the intermediate knitter a lot of warmth and a bit of mental stimulation. 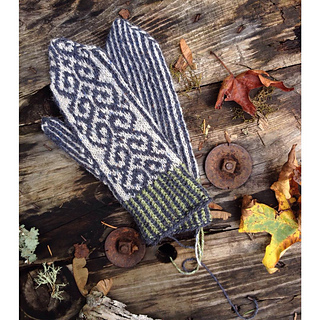 The palm is worked in vertical stripes while the back of the hand features a Turkish ram’s horn pattern, inspired by Anna Zilboorg’s book, Simply Socks. 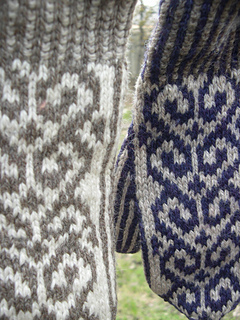 These mittens consistently use 2 colors per round; it’s a great opportunity to practice two handed knitting. The sample mittens are knit in the three natural colors of Green Mountain Green, an environmentally conscious blend of fine wool and mohair produced by Green Mountain Spinnery.